The U.S. bank prime rate remained at the 3.25-percent level it has held since the beginning of 2009. Students got a nice back-to-school break as the average rate on student credit cards dropped to the lowest level of 2013. That represents a good opportunity for students, but to put it in perspective, it was the result of a change in just one of the many credit card offers tracked by this survey. Lack of action has been the norm in the credit card market lately, and that may be a reflection of uncertainty over the economy. Uncertainty has been the economy's recurring theme in 2013. Uncertainty over Federal budget cuts and uncertainty over the impact of Obamacare have played a part in stifling the business environment this year. Now, uncertainty over U.S. involvement in Syria can be added to the list of things that cast doubt over the economy. The Syrian confrontation takes on special economic significance because of its potential to impact the price of oil. While Syria itself is not a major oil producer, the conflict has already involved other nations in the Middle East, and now threatens to become an even wider war. The price of oil is already up about 19 percent this year, and a disruption of the oil supply -- or even speculation about such a disruption -- could drive the price even higher. The inflation likely to result from soaring oil prices could be doubly bad for credit card rates. First of all, higher inflation would push all interest rates higher, and credit card rates would be likely to join in as credit card companies acted to protect their profit margins from rising prices. Second, higher interest rates would create a drag on the economy, effectively counteracting the stimulative measures the Federal Reserve has taken. A weakening economy would raise credit concerns and thus customers with less-than-perfect credit histories would be likely to face the steepest increases in credit card rates. A smooth resolution to the confrontation over Syria would by no means clear up all the uncertainty over the economy, but it would remove one significant threat to credit card rates. 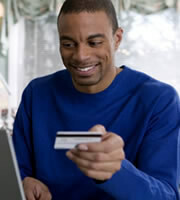 The average rate on consumer credit cards remained unchanged for the third consecutive survey. A significant drop in rates on one of the student credit card offers tracked by this survey resulted in a 27 basis point drop in the average student credit card rate, to 17.35 percent. This was more than enough to reverse a 20 basis point jump in student credit card rates in August, and it brings the average student credit card rate down to the lowest level since early October of last year. Business credit cards have been an especially stable area of this survey, with no change in rates since April. With no change in the consumer credit card offers tracked by this survey, the spread between the average rate for customers with excellent credit and the overall average remained unchanged at 4.10 percent. This spread is one of the dynamics of the credit card market that could be affected if the economy worsens. If economic conditions - especially those involving employment and wages - weaken, then mounting credit concerns would be likely to force this spread wider as customers with questionable credit histories would see their rates rise. 0 Responses to "Student credit cards drop to lowest rate of the year"